I have received a few inquiries from readers about the Apocalypse Art Prize, which we wrote about back in March, since their website was offline for a time. I have received notice from the organizer of the competition, Gloria Thomas, that the problem has been fixed. The Apocalypse Prize is a religious art competition which as been developed to stimulate interest in Medieval Art as a resource for contemporary religious artists. This is an international, free entry painting competition which is open to all; the deadline this year is December 31, 2017, and the grand prize awarded is $10,000. 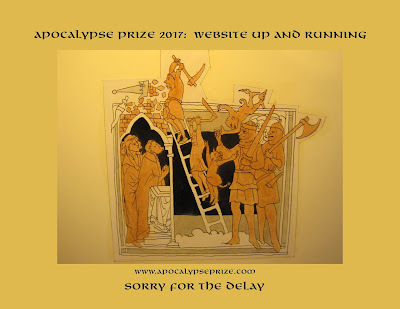 Subjects and media are specified on the website, http://apocalypseprize.com, where you can also find several videos and essays which are intended to facilitate a deeper understanding of the use of the figurative language of Sacred Scripture in Medieval Art. You can also read about how the competition was instituted by artist Gloria Thomas in this article from 2015.